Can This New Tracker Fight Seasonal Affective Disorder? A new piece of technology offers a novel way of treating seasonal affective disorder. 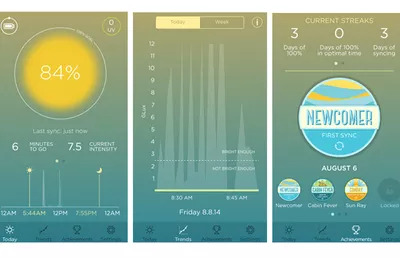 Learn about the latest health device SunSprite. In case you haven’t noticed, the sun is setting at 6 p.m., people. Daylight savings time has come and gone. And our gripes about the lack of light in our lives are not without merit—humans truly are solar powered. “We were meant to get daylight, and it is only an accident and byproduct of modern life—sitting at computers indoors all day—that so many people don’t get daylight at all,” says Jacqueline Olds, MD, associate clinical professor of psychiatry at Harvard Medical School. “Bright light is what keeps our circadian rhythms in good order.” And our circadian rhythms are something we want to keep on track—they affect body temperature, digestion, alertness, sleep patterns and mood, she says. Unfortunately, many of us don’t get enough bright light to keep our circadian rhythms stable—especially in higher latitude countries, like the U.S., where the days get short come winter. Enter, restless nights, sluggish days and seasonal affective disorder (SAD), which hits about one in 10 Americans each winter, according to a study by the National Institutes of Health. Meanwhile, the less severe “winter blues” affects another two in 10 people, according to Richard Schwartz, MD, associate clinical professor of psychiatry at Harvard Medical School. Can a tracker fight seasonal affective disorder? One treatment for SAD involves increasing your light exposure—but it can be difficult to tell how much you’re getting each day. So this fall, Schwartz, Olds and the other scientists behind GoodLux Technology, released the first light-tracking wearable device for consumers. Called SunSprite, the tiny Bluetooth-enabled gadget (which is selling for $149) fastens onto your clothes and detects any broad-spectrum white light that hits it and, thus, you. For people with SAD, or a bad case of the winter blues, doctors might prescribe a certain amount of light exposure. The “gold standard” dose is 30 minutes of 10,000 lux light, one hour of 5,000 lux light or two hours of 2,500 lux light. (Note: “Lux” is a universal unit of light intensity.) To put that into perspective, indoor lighting is about 100 lux, while a bright, sunny day can hit 50,000 lux or more. However, an overcast sky (like you see often during the winter) usually ranks at only 1,000 lux or lower. To track your light exposure and progress, simply take a peek at the 10 LED lights attached to the face of the device. Each light represents 10% of your daily bright light goal. Light up seven and you’re 70% of the way there. Here’s the catch: If you are going to hit your bright-light goals this winter, you will most likely also need to purchase a light therapy box, an indoor device that mimics the effects of outdoor light, according to Olds and Schwartz. Luckily, the SunSprite can track light exposure from one of these boxes, too, so you can still use it to keep track of your daily exposure as you battle away the blues. Worried about skin cancer from all that sun exposure? The SunSprite has a UV sensor, which warns you when the rays get intense enough to cause sunburn. (A distinct possibility if you’re going skiing sans sunscreen). Bonus: Simply wearing the solar-powered tracker charges it, so you’ll never have to fiddle with cords or worry about your device dying mid-day. You can also sync the gadget to its iOS companion app to check out real-time data such as how much light you’ve gotten and at what times, how much more light you need, and the intensity of the light you’re basking in at that exact moment. Plus, if you enter your desired bed time and waking time into the app, it will recommend when some darkness might help ease you into a good night’s sleep.